Do I Need to Wash Quinoa? A great question from Ann, who has been on retreat with me in Ojai, CA. The short answer is that washing quinoa is in most cases unnecessary. 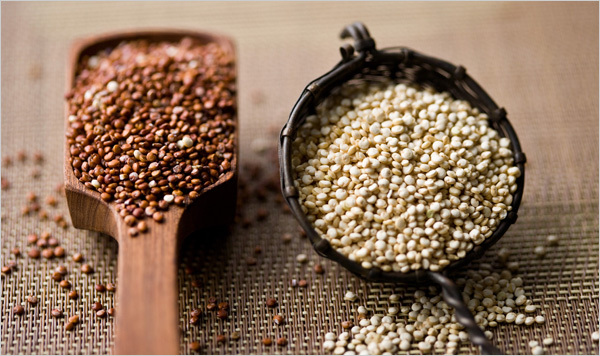 Quinoa seeds are naturally coated with a substance called saponin, which serves as a natural insecticide and deterrent to birds consuming the grain while it’s being grown. While saponin can be beneficial to the human body (it’s found in other foods like soybeans and red grapes, and has been found to lower cholesterol, cancer prevention and more), the form it takes on quinoa can not only be bitter to the palate, but is slightly toxic and can trigger stomach cramps and other digestive ailments. You may have heard of saponin as an ingredient in soaps, detergents, shampoos and so forth. Saponin provides a sudsy quality to these items, and for this reason, you can easily gauge the amount in your quinoa by putting a small handful into a bowl, adding water to cover the quinoa, giving it a stir and seeing how much suds-iness is produced. In most cases, you’ll find the “suds" that are produced to be minimal. In my personal experience, quinoa has become far less sudsy over the past 5 years or so, which seems to indicate that the cleaning process is becoming more and more effective. If your quinoa looks very soapy, it can’t hurt to give it a quick rinse. Alternatively, if you have a batch of quinoa that is very bitter, chances are it’s got a fair amount of saponin in it. Use the rinsing technique below to give it a wash before cooking it in the future. Washing, Draining and Sprouting Quinoa If you’ve ever washed quinoa, you know it can be a bit of a challenge. If you have a very fine metal sieve, you can place the quinoa in there and rinse it directly under your tap. You may find that the holes are too large and lots of quinoa falls through, in which case you can use my favorite quinoa washing technique: Place quinoa in a small bowl or glass measuring cup, and fill with water to cover the quinoa. Then, stretch a piece of pantyhose (using a pair you’ve bought specifically for this purpose) over the top of the container and secure it either with your hand or a tight-fitting rubber band. Pour excess water out of the container while the pantyhose keeps the quinoa from trickling out. Remove the pantyhose, and you’ve got rinsed quinoa ready to go. If a number of grains stick to the container you washed them in, remove a little cooking water from the pot you’re adding them to and swish it around to loosen the stragglers. In my personal experience, washing quinoa is almost always unnecessary these days. Washing it certainly can’t hurt, but if you’re pressed for time or want to keep things simple, there’s likely no harm to add quinoa straight to boiling water. What’s on your mind? Ask any questions related to diet, food preparation or lifestyle in the comments below, and I’ll address them in an upcoming post.